We had a wonderful dinner on Christmas day. 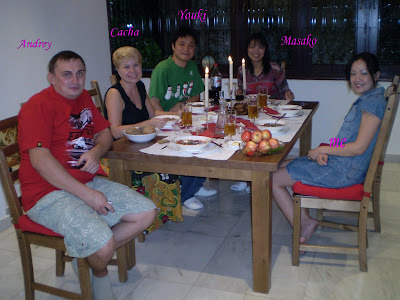 We were invited to Andrei's (mybb student, Russian) and Katya's (Andrei's wife, Russian) place to celebrate Christmas. Masako (mybb student, Japanese) and Youki (Masako's hubby, Taiwanese) were the guests invited, too. What comes to your mind when you think of Russian food? Not only about food but I learned a few simple rules of Russian etiquette! Such as remove your outdoor shoes. You will be given a slipper to wear if you are invited to a Russian's house. Offer to help the hostess with the preparation or clearing up after a meal is served. This may be turned down out of politeness. Katya was showing us how to cook Borsch, Russian beetroot soup. Soup is an important part of every meal in Russia. Masako was decorating the cheesecake that she baked. If you are invited to a Russian home for a meal, it is appropriate to bring a gift, such as a bottle of wine, dessert, or a bouquet of flowers (Do not give yellow flowers). Vodka, Russia's trademark alcoholic beverage. Coca-cola chicken, prepared by mybb. We were told that, having a shot of vodka or two along with a dish has been a traditional start for a dinner. They taught us how to drink in their style. They poured the vodka NEAT in a small shot glass, bread with butter and garlic on another hand. Drink the alcohol one shot then eat the bread immediately to put the fire out. OMG!!! I really do not have a strong immune against alchohol. I felt like I could see everything around me in 360-degree, I am on fire after one shot. No joke. Refusing a drink or a toast is a serious breach of etiquette unless you give a plausible excuse. an extra glass for juice or soft drink at each setting. Russians love sour cream in everything! Borsch – the most popular and famous Russian soup made of beetroots, cabbage, potato, carrot and meat served with sour cream. I love this! The main course. They love potatos. Leaving a small amount of food on your plate indicates that your hosts have provided ample hospitality. perfect with a cup of tea. All in all we enjoyed ourselves completely. Watched their wedding video in St.Petersburg. We learned and laughed a lot! They are great people and simply wonderful. spa`sibo. How was your christmas? I hope you had a wonderful one! I never knew that TOO! Why Singapore Teachers "Vomit Blood"